We have compiled a list of the best workouts that will make you boast about your biceps sooner than the usual. Just make sure you do each routine slowly and controllably. Just carefully follow the descriptions of each routine as well as the schedule, especially for beginners. First Routine: Close Chin Up. This is similar as the usually chin ups done on a bar, except that you have to keep your hands closer together, as you use the strength in your arms in pulling your body off the ground. Second Routine: Standing Barbell Curl. As the name implies, this routine is accomplished through standing up. One holds the barbell with both hands facing away from the body, with both arms extended to the thighs. One then curls the bar upwards, and towards the body, as the elbows are flexed or bended. Third Routine: Preacher Curls. These are done with a barbell however they are seated on a preacher bench. Meanwhile, while sitting, the barbell should be gripped with the underhand gripping elbow being extended with hands about a shoulder width apart. The bar is then curled towards the shoulders. Fourth Routine: Dumbbell Curls. Performed similar to that of a standing barbell curl, but with an exception: the dumbbells should naturally fall a little to one’s side in contrast to having let it fall straight in front of your thighs. Fifth Routine: Dumbbell Curls: Though done just like a regular dumbbell curl, this routine includes sitting on a bench which is propped up at a 45-degree angle. Sixth Routine: Hammer Grip Curl. This can be accomplished through standing or sitting. 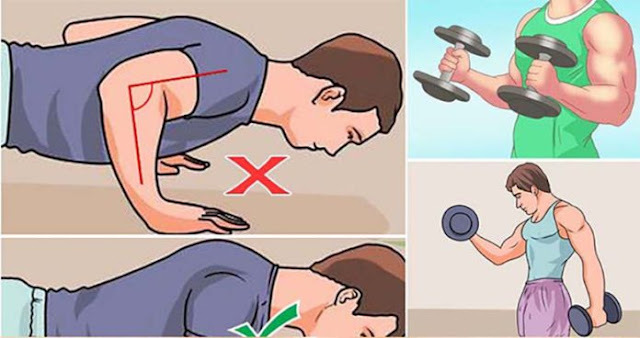 The rest of the actions are that of a dumbbell curl but the grip of the hands are facing towards one another instead of facing the body. The weights are then curled up keeping the knuckles facing one another. Seventh Routine: Concentration Curls. This is accomplished one arm at a time in order to concentrate on the one muscle being worked, as the name implies. This is done sitting with your elbow resting on your knee. Note that the dumbbell is lowered slowly, extending the elbow, and afterwards slowly bring it back up. The following is a program on which weights to use using the routines specified. First week, Day 1: First week focuses more on light weights with a transition to medium weights. Execute two sets of 10-12 reps of 3-4 routines that you would like using light weights. First week, Day 3: Execute 2 sets of 10-12 reps of the rest of the routines you did not choose to do on Day 1. First week, Day5: Execute 2 sets of 8-10 reps of your 5 preferred workouts using medium weights. Second Week, Day 1: Execute 3 sets of 8-10 reps of 4 routines using medium weights. Second Week, Day 3: Execute 2 sets of 10-12 reps of 5 routines using medium weights. Second Week, Day 5: Execute 2 sets of 10-12 reps of 5 workouts in medium weights. Third Week, Day 1: Execute 3 sets of 10-12 reps of 5 exercises using light weights. Week 3 focuses on light weights with a transition to heavy weights. Third Week, Day 3: Execute 3 sets of 8-10 reps of the 5 routines using light weights. Third Week, Day 5: Execute 1 set of 6-8 reps of 3 routines using heavy weights. Fourth Week, Day1: Execute 2 sets of 6-8 reps of 2 routines using heavy weights. Fourth Week, Day 3: Execute 2 sets of 6-8 reps of 2 alternating routines using heavy weights.